Well school starts for my kiddo's tomorrow and we are excited. It just feels like fall for some reason and the smell of new pencils & school supplies are only adding to the kids excitement. These are the gifts that I made up for each of the kids teachers. I wish I could say that I came up with this idea, but thanks to the blogging world I got this idea & vinyl from this Etsy Store. I wanted all 3 to be like the small glass jar (Mrs.Crayton's) but living in this blessed little town I was only able to find 1 of these jars. So the other 2 are larger hurricane ones that I picked up at Wal-mart and had to fill them with 3 times the amount of pencils. Well I must start dinner and make sure the kids have all their school stuff ready to go that yellow school bus will be here at 7:20 tomorrow morning. The clock is ticking! What a terrific idea!!! I have never thought of giving the girls' teachers a gift on the first day of school! At this point I"ll have to wait until next year! I hope your darlings enjoy their first day back to school! absolutely darling. I have that etsy store favorited too... such cute ideas! Your teachers will love it. So very cute! You are an amazing woman and very talented. Your kids are lucky to have you as their mother. I bet the teachers will absolutely love the gifts! I'm IN LOVE with this project/gift!!!! How did you do the lettering? Did you have to order vinyl? Do tell! I love it, love it! Great job! those are so lovely. and how handy!!!! You are so thoughtful to give the teachers gifts on the first day. As a former teacher, I can tell you I'm sure they greatly appreciate it. Cute idea! You are so good...love this idea! *GASP* This is the cutest thing I've ever seen!! i love this idea.... so great! even though it was not yours, the wrapping and the pencils are too darn cute! Those teachers are lucky to have you as a mom for their classes! do you get a commission on these? i hope so, the sales will soar after your post! i'm ordering some for my teachers and passing the idea onto a friend! thanks! You're so freakin crafty it makes me sick!!! Oh, and YAY for the first day of school!!! Awesome idea! LOVE your blog. You have great things on here! Super cute AND I'm jealous that your kids are just starting. We're into Week #3 around here - blah! That is such a neat idea. I bet those teachers love you. How thoughtful to bring them a gift, and how appropriate. Kids are always asking to 'borrow' a pencil. What a great idea! I am gonna have to steal this idea! My daughter's teacher would love this! Now THAT is an excellent idea! Do you think if I would give a first day gift my boys would just get straight A's right from the start? J.K. But if they get into trouble I think I will start sucking up sooner than Christmas. Thanks for the brilliant gift idea. Fabulous idea! I know they will be a huge hit. I'm supposed to give first day of school gifts too? I can hardly remember teacher appreciation week, christmas, and end of years gifts. Those are darn cute though. Thanks for visiting my blog today. Nice idea. Woo hoo for school huh? I am sure it is bitter sweet but probably more sweet then bitter. WOW I missed this blog. Gosh gotta make that does not happen to me again. I love this idea. I would have never thought of doing a gift the first day but how sweet. Teachers buy so much out of their pockets it's nice for them to know that some parents are willing to help them out. I am going to have to borrow this idea for next year. I am sure you won't mind. Have a great day Rachel! So cute! I think I will have to order that lettering, adorable! What a great idea, I'm sure the teacher loved them! well if that isnt just the best idea ever?! I love it!!! I just think this is so cute ! I might just have to copy it. I hope you don't mind! Thanks for the AWESOME post! They turned out darling! I am a middle school teacher in Brooklyn NY and I never got a cute back to school present. Those are so personal and very thoughtful. I bet the teachers loved them!! THANKS! I love that idea, and have bookmarked it for the future. As a teacher (7th grade math) I love this gift idea! It is awesome! I went to the Etsy store that you linked and was unable to find that product. Can you help me with the name of it? Or more info on it? Price? Thanks in advance! I have just spent over 1.5 hours on etsy looking at wall vinyl!! TOO MUCH FUN!! I see so many that would fit into my new home. DH is just rolling his eyes. Thanks, I think. I love your gift you gave the teachers almost as much as I love the photo of front and back of your kids waiting for the bus! 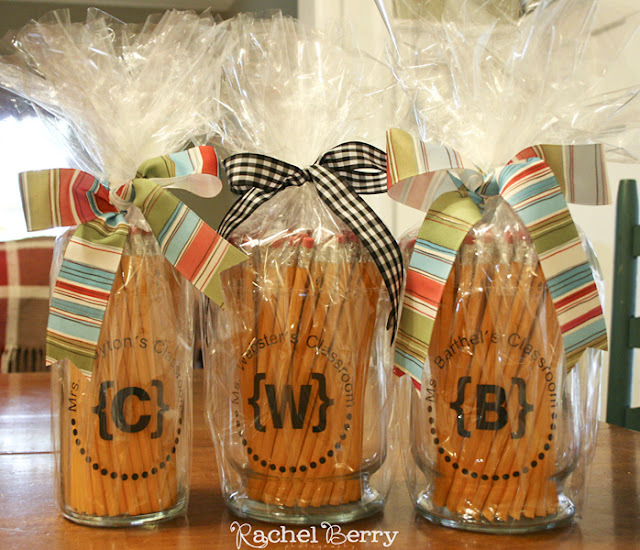 This is a great gift and I love those jars! What a darling idea...both wrapped up and without the cello on it. I hope you're okay with me sharing this idea with my fans too...but I'll give you complete credit and tell them about your darling blog. Love it!! I love this idea, but we don't find out who the teachers are until a couple of days before the first day of school. Any suggestions? This is what I am doing - Thanks for the idea - perfect for a male teacher that are hard to buy for -they just don't like candles and totes! As a repost - I just got done making mine and is so cute. Looks just like the middle one in your photo. The most expensive part was the vinyl but well worth it. I paid $2.99 for the glass vase at Michael's (would have been cheaper if I had my 40% off coupon) - I found it in the candle section, not the flower section. Got 72 pencils for $.50 at Staples and there ya go! Loved these so much I made some for Laci's teachers, thank you for the inspiration! You rock! I am a new follower! Have a great weekend! 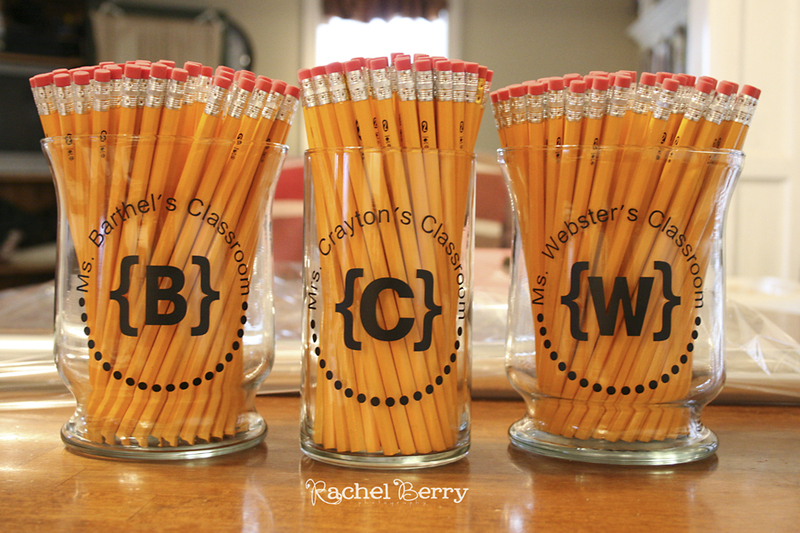 Love this idea and as a teacher nothing makes me happier than presharpened pencils! Just an idea to make that happy even happier! It's the little things in a teacher's life!